Quinte Country and Prince Edward County have a special place in the heart of the TravelInOntario.com website founder. 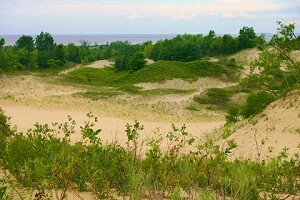 Before this region was as well-known as it is now, many lazy summer weekends were spent at Sandbanks Provincial Park (which some locals might remember as The Outlet) making sandcastles. Make sure to investigate the mysterious Lake on the Mountain (more like a big hill) Provincial Park and try to solve the mystery of its water source. The National Air Force Museum of Canada in Trenton is important as this is an active airbase. Wineries are relatively new to Prince Edward County, despite the very long history of growing fruits and vegetables. Belleville claims the title "Sportfishing Capital of Ontario." Picton's Regent Theatre is still showing movies as well as The Mustang Drive-In. First Nations culture is represented in Deseronto and Tyendinaga Mohawk First Nations Reservation. Quinte Country and Prince Edward County accommodations include hotels, motels, resorts, bed and breakfasts and campgrounds. This is Belleville's first & only extended-stay hotel where you can balance work & life as you like, in a homelike setting with high end modern amenities. Feel at home with a fully equipped modern kitchen, warm, inviting living space, high-speed Internet access and a hot breakfast daily. Our Belleville bed and breakfast has four rooms with original artwork, antiques, luxurious linens, and amenities. All rooms have access to a grand parlour, stately dinning room, inviting library, front verandah and semi-private 2nd storey verandah. The manicured grounds include several gardens. We are pet-free and smoke-free. On select afternoons, we provide a full three course High Tea. We are located in the retail and business district of Belleville and offer personal and friendly service that sets this hotel apart from others in the area. This Belleville hotel is conveniently located near points of interest like the Quinte Mall, the Quinte Sports Centre, the Bay of Quinte, Quinte Exhibition & Raceway, Loyalist College and Albert College. Located along the Bay of Quinte, this Belleville hotel features an indoor pool with waterslide and rooms with a balcony. Free access to the outdoor heated pool and game room is provided to all guests. A tennis court and a small gym are on site. A cable TV and free Wi-Fi are standard in every room. All rooms include a coffee maker. Conveniently located off Highway 401 in Ontario, the Best Western Belleville offers a friendly, helpful staff and luxury amenities. This full-service Belleville hotel is located minutes from a variety of local restaurants and shops as well as Belleville's Industrial Park. We are located in the heart of Belleville's historic downtown area, less than two miles from area attractions like the Pinnacle Playhouse, the Empire Theater, the Bay of Quinte and Shannonville Motorsport Park. This Blue Mountains resort features suites with access to outdoor pools, whirlpools and saunas. Suites contain a kitchen or kitchenette and are equipped with a TV and DVD player. Some suites offer a gas fireplace. The resort offers golf and biking during the green seasons and skiing through the winter. Guests have access to a fitness center, a games room and free shuttle service within the resort. Spacious rooms are complimented by a large heated indoor pool, spa and fully equipped fitness centre. Fairfield Inn and Suites by Marriott is conveniently located just off HWY 401 and HWY 62 S. across from the Quinte Mall in the heart of the shopping and entertainment district. This Belleville bed and breakfast offers a continental breakfast and spacious accommodations with free Wi-Fi. Each room features a downstairs living room with a futon, recliner and video library. There is a minibar and microwave along with cable TV. The bathroom provides a clawfoot bathtub. The breakfast room in this Victorian-style house features a fireplace. Our Belleville hotel is near local attractions such as the Glanmore National Historic Site, the Hastings County Museum of Agricultural Heritage. Enjoy a delicious meal at on-site restaurants, Rise N' Shine, open for breakfast and lunch, or Hibachi and Buffet. Step into the privacy of your own guest room with amenities including a cable TV, desk with lamp, free local calls, and wake-up service. Private entrance to all suites at this hotel in Picton. Immaculately clean and well maintained accommodation. Fully equipped sit down kitchens. Wireless high speed Internet. Large modern bathrooms with tub and shower. Barbecues and outdoor dining area and a reserved one car per suite parking. Isaiah Tubbs Resort is 5 km from Sandbanks Provincial Park. The rooms are equipped with satellite TV, a coffee maker and refrigerator. Lunch and dinner are served at the Restaurant on the Knoll. Several wineries, including the Waupoos Estates Winery, are within a 20 minutes’ drive. Featuring free WiFi and a seasonal outdoor pool, these Cottages, located in Picton is close to attractions. Free private parking is available on site. Some units have a balcony and/or patio. Some units also have a kitchen, fitted with an oven. Towels are available. There is also a children's playground. A yoga retreat weekend at this retreat in Picton always includes private or shared accommodation, fully vegetarian, organic meals, silent walks through a private forest, guided yoga and meditation classes and a variety of healing activities that differ with each retreat. Just a 5 minute drive from downtown Picton, Bells and Whistles Family Inn is 12 km from Lake on the Mountain Provincial Park. It serves a hearty homemade breakfast every morning. Free Wi-Fi access and a flat-screen TV with a DVD player are included in every room. Rooms have an ensuite bathroom. Prince Edward Community Centre is a 6-minute drive away. This eight room hotel centrally located in Picton and close to natural attractions. Each room features en suite bath/showers, air conditioning, free WiFi, cable TV, a coffee maker, iron and ironing board and hair dryer.